[post_ads]Trump's trip to Belgium, Britain and Finland was marked by his frequent taunts and threats aimed at America's NATO allies, a sharp contrast to his unrestrained bid to curry favor with Russia despite the conclusion by U.S. intelligence agencies that Moscow meddled in the 2016 U.S. election to aid his candidacy. Even for Trump's high-drama, tweet-driven presidency, this was the most heavily criticized trip abroad of his 18 months in office. The only smooth sections were a tea at Windsor Castle with Queen Elizabeth - although he kept the nonagenarian monarch waiting and walked in front of her - and golfing at his own Turnberry course in Scotland. In Brussels, Trump sowed confusion and chaos, blasting NATO allies for not contributing enough money for their own defense, then praising them for their contributions. He arrived 45 minutes late to the second day of meetings and hijacked the agenda. In an insult aimed at German Chancellor Angela Merkel, Trump called Germany a "captive" of Moscow for its support of the Nord Stream 2 gas pipeline from Russia. Hours later, he said he has great relations with Merkel. Trump criticized the Brexit deal that she negotiated regarding Britain's departure from the European Union, then called her a great leader who should do as she sees fit. Allies had hoped that his "America First" bluster, trashing of Western leaders and questioning of the post-World War Two defense framework would not translate into permanent damage to relations. A senior NATO diplomatic source, who was in the meetings at last week's NATO summit, said the mood was grim in the wake of Trump's visit but there was also relief that he did not force a change in policy. "The expectations in Europe that Trump would mellow are behind us now, we no longer have those illusions. But we need to put constraints on this, we need less histrionics," the source said. Leslie Vinjamuri, head of the U.S. and Americas program at the Chatham House think tank, said Trump's style of first criticizing allies through tweets and then declaring publicly that all was well was part of a pattern that seemed intentional. "The fancy term is multi-vocal signaling - in other words he sends messages out within the same half an hour, the same hour, and he's speaking to different audiences. He's very effective at it. Much of what he was doing on this visit was doublespeak," Vinjamuri told reporters. On the eve of his summit with Putin, Trump added insult to injury by calling the EU a "foe" for its trade policies in a CBS interview that aired on Sunday. That language stood in stark contrast to the scene on Monday at Finland's presidential palace, where Trump called the Russian leader, accused by the West of all manner of grievances, a "good competitor" and "I think the word competitor is a compliment." "Coming close on the heels of President Trump's bombastic and erratic conduct toward our closest friends and allies in Brussels and Britain, today's press conference marks a recent low point in the history of the American Presidency," Republican Senator John McCain said in a statement. The president's critics pointed to Trump's refusal to publicly criticize Putin, who again denied that the "Russian state" interfered in the U.S. election and seemed puzzled by why the question kept coming up. 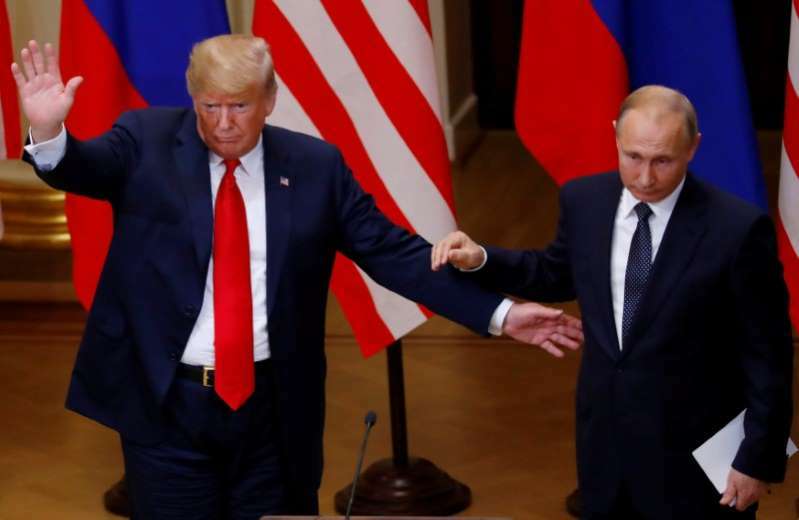 Always seeing the U.S. investigation into Moscow's interference as casting doubt on the legitimacy of his 2016 election victory, Trump said that while American intelligence blamed Russia, he gave credence to Putin's "extremely strong and powerful" denial. Trump left with no concrete achievements from his long-desired summit with Russia's leader. Putin, who has been staring down American presidents since he rose to power in 2000, dismissed Trump's concerns about Russia's annexation of Crimea and gave vague promises to hold a dialogue about Syria and nuclear weapons. At the end of the event, Trump left with a tangible gift: Putin handed him a soccer ball to mark Russia's hosting of the World Cup. One U.S. senator suggested Trump check it for listening devices and never let it enter the White House. "I think his base feels that it would have been rude and not productive to stand not six feet away from the president of Russia and call him a liar," said Republican strategist Barry Bennett, a former Trump campaign adviser.